This spring, it seems like all we really want to wear are cool, chic basics. For us, this means classic staples like denim, ballet flats, and striped shirts -- kind of like what January Jones is sporting in this photo. However, January has eschewed traditional skinny jeans in favor of flared denim, and we have to say -- we're really into it. We always find that in the warmer months, skinny jeans are a little hard to wear. If they're tight around the ankles, it's easy to become overheated -- not to mention, after pairing them with boots all winter, we're kind of sick of them anyway. Enter the flare jean. January is wearing a pair by one of our favorite brands, the James Jeans Nuboot in the Coastal wash, a classic true blue pair of denim. While she's wearing hers with ballet flats, we're picturing them with flat or heeled sandals. This style is incredibly easy to dress up or down -- try a peasant blouse during the day, and a fun tank at night. 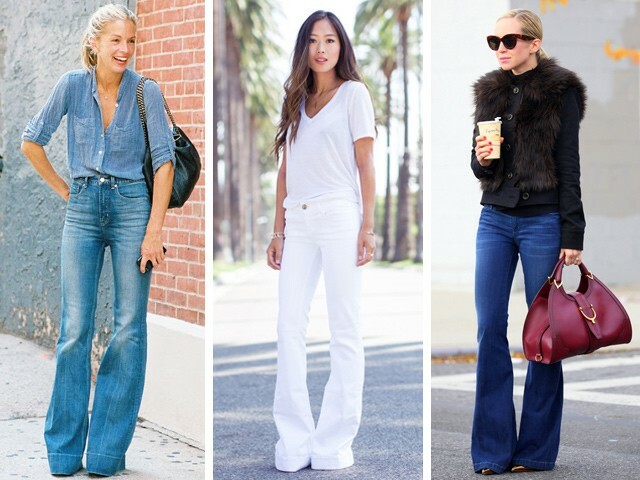 You can bet after seeing this photo, we'll be rocking flares all summer long.